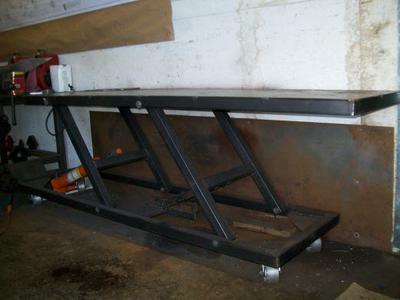 Cost Of Materials For Lift Table and Chopper Frame! We are asked often what the cost of materials are for our frame plans and lift plans. We will do our best to describe this for you. The following cost of building materials are a ball park and could be a little more or a little less depending on where you buy your materials and when, and what kind of discounts you can find. 6 qty of 8' long 2x2x11GA structural steel tube is $34 each so about $200. Caster Wheels - $10 each at harbor freight. 4 total so $40. The cost is $60.00 for a 24"x24" 14 gauge tread sheet from Ace Hardware. We need 4 pieces so it is $240 for the tread. Using tread this thin may require some additional support in the middle. We can replace steel tread with 1/8" aluminum tread if we want to save cost. 12" x 24" sheet is $25.00 we need 7 of these total $175.00. 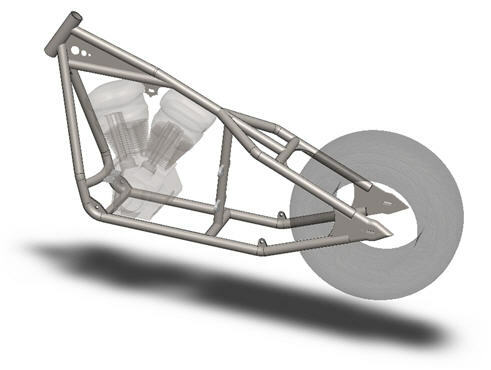 The design uses 1/4" steel plate on the top to withstand the 1100 lbs of force from the weight of the bike. Just steel sheet 12x24"x1/4" is $40.00 each. We need 7 of these so total cost is $280 for the top steel plates. Total cost of materials is approximately $700.00 or so depending on where you buy the materials. I would add a contingency of $100 to that number and say that total materials cost around $800 just to be safe. Read this about our plans: Cheap Lift? Order tubing and other metals at Online Metals for the best prices.